Grandma's Knitting Place: Oh no!!!!! Another yarn sale!!!!! Ok - so I broke the diet - but this time who could blame me!! Spotlight were having a ONE-DAY-ONLY 20% off EVERYTHING sale, including previous sale items. So my friend Claire and I set off early Monday morning, loins girded, to avail ourselves of some GOOD STUFF!! I got this bag of mixed goodies for $5 - less 20% which is $4.00!! 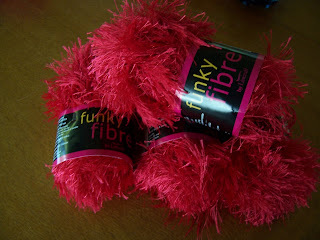 Nine balls of Feathers yarn in a caramel colour. One ball of Vixen. One ball of blue fluffy yarn with glitter and woven lumps. One adult poncho weaving kit and one large crochet hook! The weaving kit consists of a poncho shape netting in black yarn and you weave fabric, or yarn throught the netting and add beads or feathers or other decorations, and you have a really individual poncho without knitting. Claire and I worked out there was a good $30 worth in there!! Claire bought a $10.00 bag and got some fantastic bargains - about $60.00 worth!! I also got some more feathers yarn in beautiful jewel colours, reduced to $.99c a ball and with the 20% off got three balls for $2.00!! Bargain!!! I use the feathers to make these pretty little hats with a rolled brim and crown in contrasting or toning yarn. 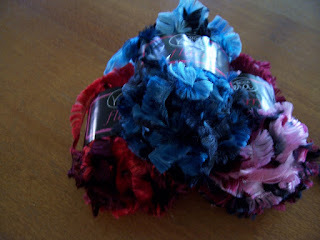 I now have a big box of feathers in gorgeous colours - can't wait to get started! These will be for sale for the winter months soon to come. I bought 4 balls for .99c each , gave the assistant $4.00 and got .05 cents change!! LOL!! So my whole shopping expedition cost me $9.95 !!! I never get bargains like this normally - so who is a happy camper, then?? 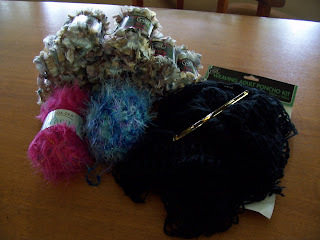 I am going to justify this expenditure and breaking of my yarn diet by emphasising that the Funky Fur is for a specific requested project, and the Feathers is going to earn me some money from sale of the hats, which will then pay for what I spent - and also of course, I will be using other yarn from my stash to make the aforesaid hats!!!! That's my story, and I'm sticking to it!! Let me see if I've got this right... you ARE participating in KFYS 07 ? Funny but I could swear you were on a yarn diet. spinning or dyeing supplies don't count [ ergo anything cream or white is fair game because I'm going to dye it ... someday ] and on sale in the back room at Bendigo Woollen Mills doesn't count either. If you want to make a similar rule relating to Spotlight well that's entirely up to you, right? I'm gonna have to get that BSJ pattern one of these days. They look sooooooooooo cute.